The plains and jungles of Africa are synonymous with exotic wildlife, but what many people don’t realise is that there’s just as much life to be found at the continent’s coasts. With the exception of Egypt’s world-famous Red Sea dive sites, Africa is relatively unchartered territory for scuba divers - and yet, it is home to some of the most spectacular dive destinations on the planet. From the cold waters of South Africa’s Western Cape province to the crystalline coral gardens of island nations like Mauritius and the Seychelles, Africa is a scuba diver’s paradise. 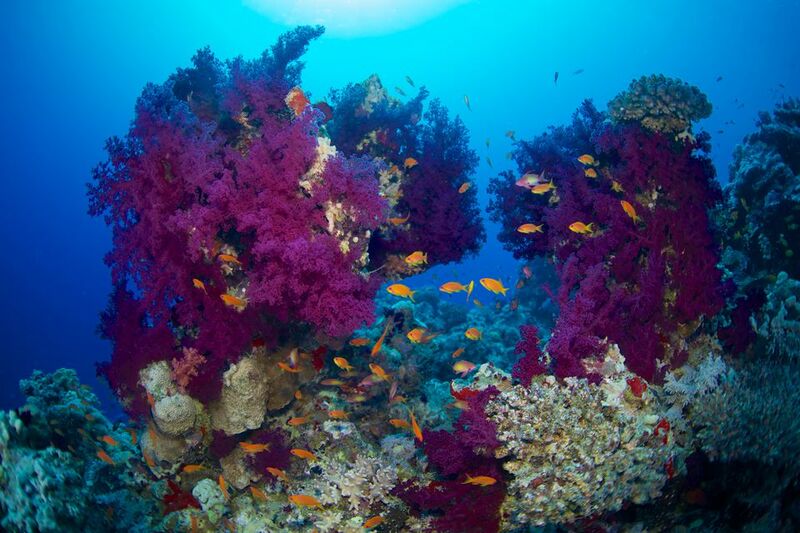 Perched on the shores of the tropical Red Sea, Egypt is something of a scuba diving Mecca. The country’s most obvious attraction is its superb conditions, with average water temperatures of around 79 F/26 C and visibility that often exceeds 130 feet (40 meters). With over 1,100 fish species recorded (of which nearly a fifth are endemic), the marine life is also astounding. Egypt’s underwater highlights include the pristine reefs of Ras Mohammed National Park, the oldest national park in the country; and the WWII wreck of merchant vessel S.S. Thistlegorm. The northern Red Sea is littered with other historic wrecks, while the southern reefs of Brothers, Daedalus and Elphinstone are famous for encounters with the elusive oceanic whitetip shark. The Red Sea is also a good place to spot scalloped hammerheads and pods of friendly spinner dolphin. ​Sudan may not have Egypt's infrastructure, but for advanced divers in the know it offers off-the-beaten-track Red Sea diving with fewer crowds and healthier corals than its northern counterpart. It is primarily a liveaboard destination, with most charters leaving from Port Sudan. It's also possible to hop on a liveaboard at Port Ghalib in Egypt and travel across the border by boat. Sudanese diving is all about bucket list megafauna. Sanganeb Atoll Marine Park is famous for its schooling scalloped hammerheads and resident pods of common, bottlenose and spinner dolphin, while Dungonab Bay supports an important dugong population. Other highlights include the wreck of the Umbria, an Italian freighter intentionally sunk during WWII with its bombs and ammunition still onboard; and Conshelf II, the underwater habitat built by Jacques Cousteau in the 1960s. Tanzania caters to a range of scuba diving interests and experience levels. The spice island of Zanzibar is perfect for new divers, with warm water, good visibility and an abundance of dive centers offering entry level courses at competitive prices. Further north, strong currents and extreme tides make Leven Bank suitable for experienced divers only; and yet huge shoals of pelagic fish provide ample reward for those willing to make the journey. In the far north, Pemba Island is known for the quality of its reefs, with hard and soft corals creating a home for an incredible diversity of marine life. Between October and March, those in search of the world’s largest fish will find them at Mafia Island, a seasonal whale shark aggregation site. Inland, Lake Tanganyika is a freshwater paradise complete with excellent visibility, non-existent current and over 280 species of cichlid. Unofficially known as the shark diving capital of the world, South Africa specializes in high-adrenalin dive sites. Aliwal Shoal in KwaZulu-Natal is one of the few places in the world where divers can encounter tiger sharks, bull sharks and oceanic blacktips without the protection of a cage; while the Shoal’s reefs provide a breeding ground for sandtiger sharks in winter. Further south, Protea Banks boasts strong currents and swirling schools of hammerhead sharks in summer; while Gansbaai, Simonstown and Mossel Bay all offer cage-diving with great white sharks. Wreck and tec divers will find plenty of sunken ships to explore off Durban, while those looking for a more sedate option will find it in the sleepy dive town of Sodwana Bay. Located on the border with Mozambique, Sodwana is known for its colorful reefs, abundant tropical fish and relatively easy dive conditions. In terms of offshore diving, Africa's Indian Ocean islands are hard to beat. Madagascar in particular stands out as the location of the world’s third largest coral reef system. The reef extends for 185 miles (300 kilometers) along the island’s southwest coast, and provides a home for approximately 6,000 marine species. Marine life in Madagascar displays a high level of endemism - meaning that you won’t find it anywhere else in the world. Diving hotspots in Madagascar include the exclusive resort island of Nosy Be on the island’s northwest coast. Here, beautifully preserved reefs are frequented between October and December by the mighty whale shark and the graceful manta ray, two of the marine world's most sought-after animals. There are also stunning reefs (and excellent whale-watching) near the east coast island of Île Sainte-Marie. From the South African border to the archipelagos of the far north, Mozambique is the unsung hero of African diving. In the south, Ponta do Ouro is famous for its resident pods of friendly bottlenose dolphin; and for high-octane dive site Pinnacles (arguably the best place in Africa to swim with bull sharks). Further north, the dive sites at laid-back Tofo Beach are defined by their fascinating topography and healthy coral cover. Tofo is one of the few places where it is possible to see whale sharks and manta rays all year round, although the main season for these species is October to March. The idyllic Bazaruto Archipelago is a protected area, and one of the best destinations in Africa for sightings of the vulnerable dugong. In the far north, the exclusive resorts of the Quirimbas Archipelago offer unparalleled wall diving and plenty of macro critters. Situated approximately 1,200 miles (2,000 kilometers) east of the African mainland, Mauritius is the main island of the Republic of Mauritius archipelago. Here, divers can expect clear waters, abundant coral and colorful marine life, in addition to an astonishing diversity of different dive conditions. On the inside of the barrier reef that almost entirely encircles the island, shallow lagoon dive sites provide the perfect conditions for beginner divers. On the other side of the reef, more experienced divers will find an exciting underwater landscape of steep walls, caves and caverns. North coast Coin de Mire and Flat Islands are especially well known for their plunging drop-offs, which attract large schools of pelagic fish and sharks. On the west coast, dive sites like Cathedral and Boulders are famous for their photogenic topography. Mauritius also has more than 20 diveable wrecks. An Indian Ocean nation with 115 individual islands, the Seychelles is a paradise destination synonymous with white sands and swaying palms. Although some divers are put off by the fall-out from large-scale coral bleaching in the late 1990s and early 2000s, most of the Seychelles' dive sites have largely recovered. With only a handful of 5-star dive resorts on the main islands of Mahé, Praslin and La Digue, dive sites are usually uncrowded. Most focus on granite boulders located close to shore - making for easy, laid-back conditions. The exceptions to this rule are Brissare Rock (on Mahé's north coast) and South Marianne (off Praslin Island), where strong currents mean good pelagic action in the form of abundant Napoleon wrasse, schooling gamefish, eagle rays and reef sharks. Between July and October, the Seychelles is also a great place to spot migrating whale sharks and manta rays.